Hi everyone, gee I'm on a roll here, so many blog entries! So many cards made in one week, it's unheard of! I think it has a lot to do with this Diorama Pop Up Card base, it's just so versatile and easy to play with! 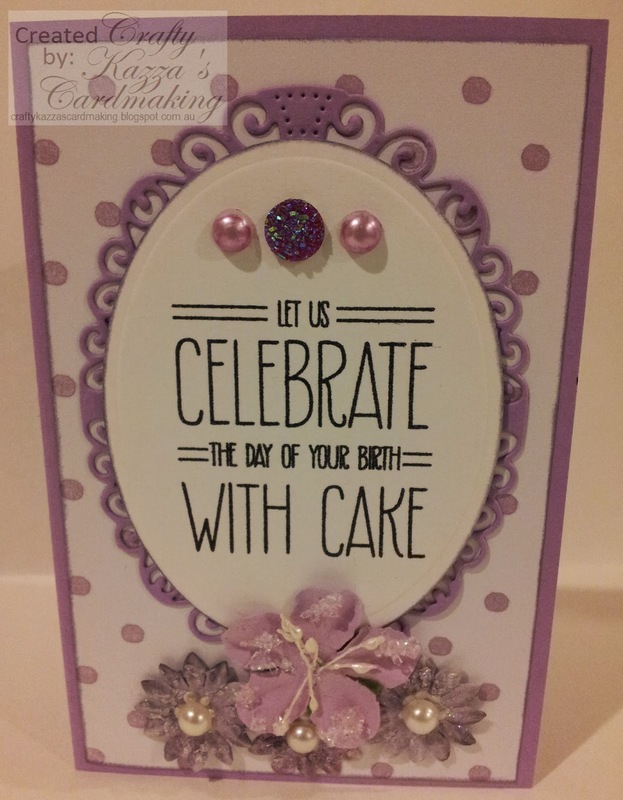 Today I made yet another of these fabulous cards and switched it up again by adding some lovely bits and pieces to it. 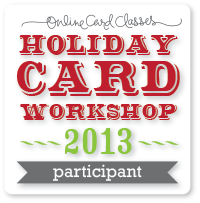 The purple oval shape on the card front was cut from the inside part. The problem with that though was that the inside bit only had about 2 or 3mm on each side of the opening and I was worried it wouldn't last. So, I thought about it a bit and came up with the soloution to shrink the opening using a normal oval (the biggest spellbinders oval I have - the bigger ones are on my wish list). So in the end, I stuck an extra panel over the cut out window and later embellished it with some corner die cuts as it was a bit too plain. The stamp set used is Cake and Candles by Avery Elle. It's a really versatile set and this is the first time I've used that sentiment, and I love how it came out! That onyx black versafine ink is so dark and crisp, I love it! The bigger flowers were from Blitsy and are by Prima and the smaller flowers started out white and were from Wild Orchid Crafts. I inked the white ones with SU Wisteria Wonder, sprayed with water to spread the ink, put some liquid glue on there and sprinkled them with Twinklets Diamond Dust and a tiny sprinkle of glitter. I'm telling you, before that tiny bit of glitter went on there, they didn't sparkle nearly as much. And yay, I finally used my Diamond Dust, I've had it for about 2years and never used it until now. It looks like course sugar and looks just like the stuff that is on the prima flowers - which is what made me think of using it for the other flowers. Finally, I put some opal coloured paper pen in the flower centres but decided I didn't like that once it was dried. So I put some adhesive pearls on (with a little glossy accents to make sure they stick good and fast) and finally a sparklet (also from Blitsy) at the top and a couple more pearls. I have to say, I have a new favourite! What do you think? Oh and I have started making instructions for the watermarking process. I've written up instructions on how to watermark using the paintbrush program that comes with Windows. I'm not sure if they are clear enough or even maybe confusing, so I've asked a couple friends to test it out and once I find out and perhaps tweak them, we're good to go. Well, I'd better go and do some chores, thanks heaps for stopping by and I hope you have a great creative week! Hi Karen, you have done a brilliant job with this diorama card. 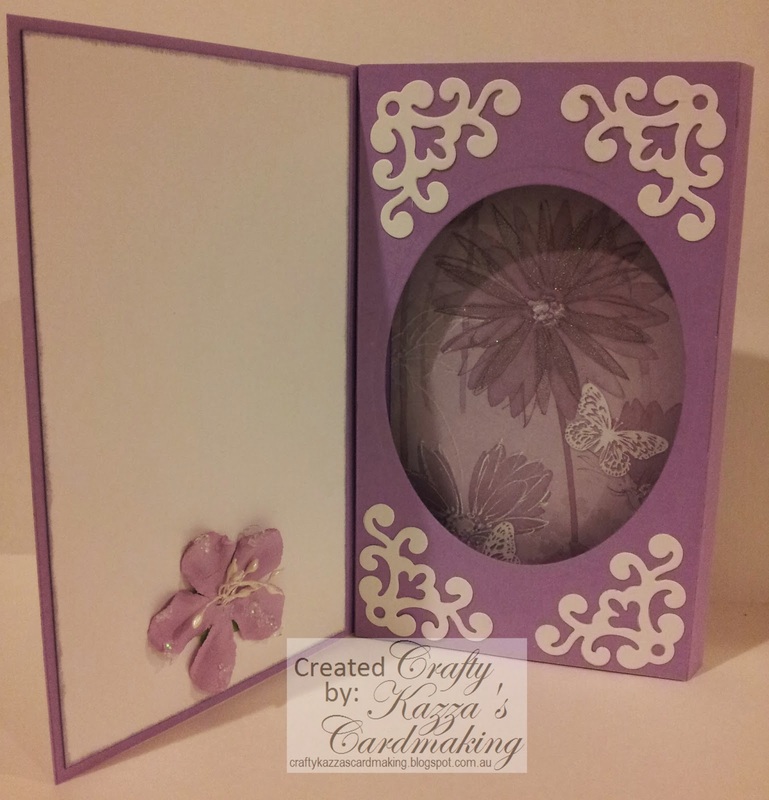 Love the colour, the paper, the decorative corners and the way you have put the whole thing together. You are very clever and it is beautiful. It is fabulous! Love all the purples !! GOREGEOUS card! I love all the purple! Thank you Julie, and thanks for stopping by! Love it! You did a beautiful job on this card. Thank you so much Arlene! Have a crafty day!